The Cisco E1200 is a relatively inexpensive wireless access point. I bought one from Amazon for under $50 dollars. It’s a Wireless-N device with transmit speeds to up to 300mbps. It operates in the 2.4Mhz band, with two internal antennas, and four Fast Ethernet ports. It comes with Cisco Connect, and support for IPV6, as well as a guest access feature. It gets even better. Starting in the spring of this year, DD-WRT open-source firmware is now supported on this device. DD-WRT will give the Cisco E1200 stability, and features that you normally see only on high-end wireless routers. With DD-WRT, you can create virtual networks or guest networks just like on the original Cisco firmware. Plus, you’ll get a ton of other features. You can purchase the E1200 for under $50 dollars. There are two versions of the E1200. Depending on what you end up with, you can download the appropriate DD-WRT firnware for the E1200 version 1 or version 2. 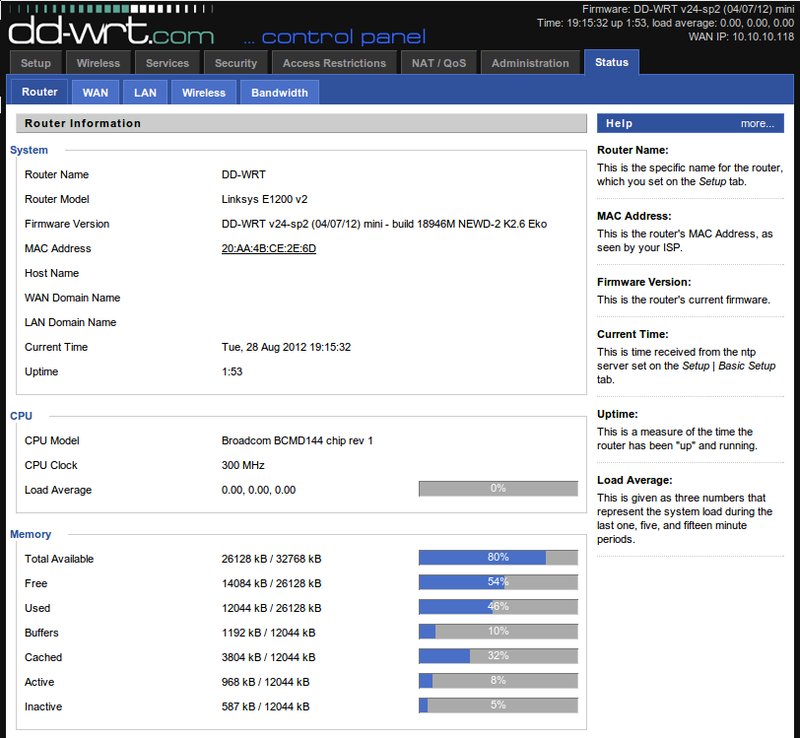 Finally, here’s a screenshot of my Cisco E1200 running DD-WRT. If you’re working with Ventrilo, you will learn quickly that there’s no Ventrilo client for Linux. It has been under development since 2005. Seven years later, it still hasn’t happened. Good news, bad news. Bad news first. The bad news is I don’t think there will be a Ventrilo client for Linux ever. But, don’t fret. There’s good news. There’s a Ventrilo compatible client for Linux called Mangler. You can download the client from Mangler’s website. Just download the appropriate version for your desktop. I’m using the 64-bit Debian-based package for Ubuntu 10.04. I downloaded it and ran the install via Gdebi Package Installer. The Mangler icon will be added under the Internet of the Gnome 2 menus, the default Ubuntu 10.04 desktop manager. By the way, Mangler works great. I was able to transmit and receive signals from a Mangler client to a Ventrilo client and vice versa. Awesome app! Ventrilo is a VoIP group communications software used by business users, gamers, or anyone needing group communication. A typical setup usually requires a Ventrilo server and some Ventrilo clients connected to it. The client software is available on Windows and the Mac. Ventrilo server is available on many platforms such as Windows, Mac, Linux, Solaris, FreeBSD and NetBSD. Ventrilo server is available in two versions: (1) the public version which defaults to port 3784 with up to 8 users, (2) and the pro version that is configurable that can run on multiple servers and thousands of users. This article will show how to install Ventrilo Server on the latest version of Ubuntu Linux, currently version 12.04. Credit goes to Ben Wagner for his article on installing Ventrilo server on Ubuntu 10.10. First, download the latest Linux version of Ventrilo Server from Ventrilo’s website. FTP the tar file to the home directory of your web server. Unpack the zipped file. Move the binaries to /usr/bin and make them executable. Insert the contents of this script into the ventrilo file. Make the file executable. Add the scripts to the boot sequence. Edit the Ventrilo config file. The contents will look similar to this. Pay attention to VoiceCodec and VoiceFormat. I’m using 3 and 18 respectively, so it’s compatible with the Mac OS clients. The standard default port for Ventrilo server is port 3784. With the public version, you can connect up to 8 users concurrently. If you have a firewall installed such as iptables, you will need to open up port 3784 for both TCP and UDP. Here are the rules you will need to add to /etc/iptables.firewall.rules. Just connect the Ventrilo clients to the server.